From entertainment and education to time management and life-improving skills – the Google Play Store offers applications that cater to a variety of users. In fact, the Android Play Store boasts more than 2.1 million apps in its database and holds the throne of being the largest app store – surpassing the Apple App Store that has a longer history in the tech industry while Google Android is relatively a newer platform. 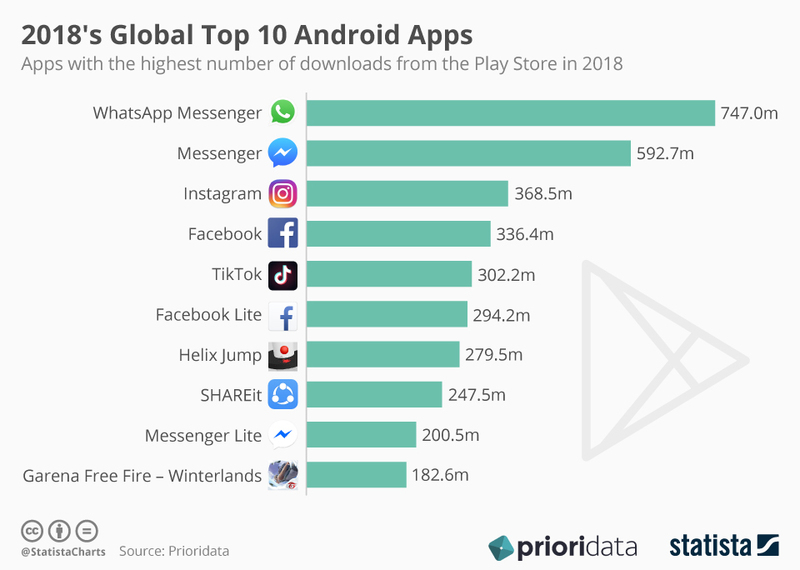 Similarly, Priori Data analyzed the user’s preference along with download figures from the year 2018 and concluded that the top ten android apps in the world had a combined download figure of 3.6 billion. Moreover, the data shows that the messaging app – WhatsApp was the most popular app of 2018 and accumulated more than 747 million downloads. Other apps by Facebook, namely Messenger, Instagram, and the main Facebook app took the second, third, and fourth position respectively while the video app and the newest kid on the block - TikTok landed in the fifth position. The results revealed the dominance of Facebook Company in the tech market as most of the app under Mark Zuckerberg’s marquee had the lion's share in the list. In fact, apps by Facebook garnered 2.5 billion downloads collectively in 2018. See the chart below that shows the highest grossing app for the year 2018 from the Google Play Store.